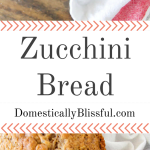 A Homemade Zucchini Bread Recipe that is simple, moist, & absolutely delicious! How was your first weekend of August? Can you believe we are already this far into 2015? This year has seriously flown by! Roger & I did our best to enjoy this weekend. We live for the weekends. We He made a yummy tortellini soup Friday night. Saturday we slept in, relaxed around our home, went for a nice walk, had a Krispy Kreme date, & started a Jaws movie marathon (ps I love Jaws 3 – if you haven’t noticed from my scopes, cheesy is my middle name). Sunday Roger had a dental school thing so I made this yummy Zucchini Bread. But in the back of our minds we were always thinking about this next year. It’s kind of hard not to. For the last 3 years we have known (relatively) what summer 2012 through spring 2016 would look like – dental school. But now that this chapter in our lives is coming to a close rather quickly we are starting to make preparations for a new chapter. A new chapter that isn’t set in stone until it’s literally set in stone. Well maybe not literally. But you know what I mean. Until it’s in writing, cold black ink against a stark white sheet of life-changing paper, anything could happen. And I think that is the scariest part. We can dream, hope, & pray. We can do our part. But at some point we have to come to grips with the fact that we can only do so much, after which we just have to trust that God is going to see us through what He brought us to. Which is hard for someone who likes to be in control. But I have veered off topic. So where was I? 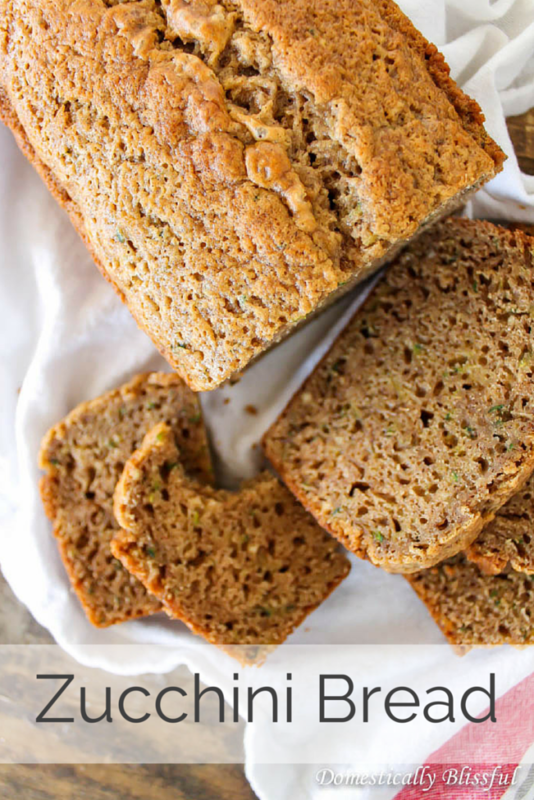 Yes, trying to get back on a topic that I never really started – this Zucchini Bread recipe! This recipe originally belonged to Roger’s grandmother, who passed it on down to her daughter-in-law (Roger’s mom), who then passed it down to me. I might have made a tweak or 2 or 3, but at it’s roots it is still Grandma Miller‘s Zucchini Bread recipe! And boy is it delicious! 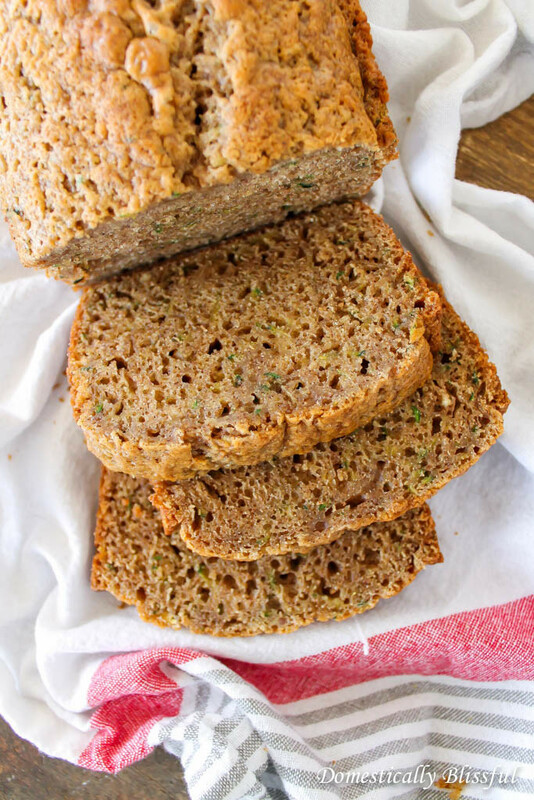 This homemade Zucchini Bread recipe makes the most moist & spongy bread that will have you coming back for seconds & thirds! First, preheat your oven to 325 degrees fahrenheit & spray 2 bread pans with oil. Blend the 3 eggs, 2 cups of sugar, & 1 cup of sour cream into a nice cream. Then add the 2 cups of grated zucchini, 3 teaspoons vanilla, 3 cups all-purpose flour, 1 teaspoon salt, 3 teaspoons cinnamon, & 1 & 1/2 teaspoons baking soda & blend until combined (approximately 2-3 minutes). Fold in walnuts if desired (*1). 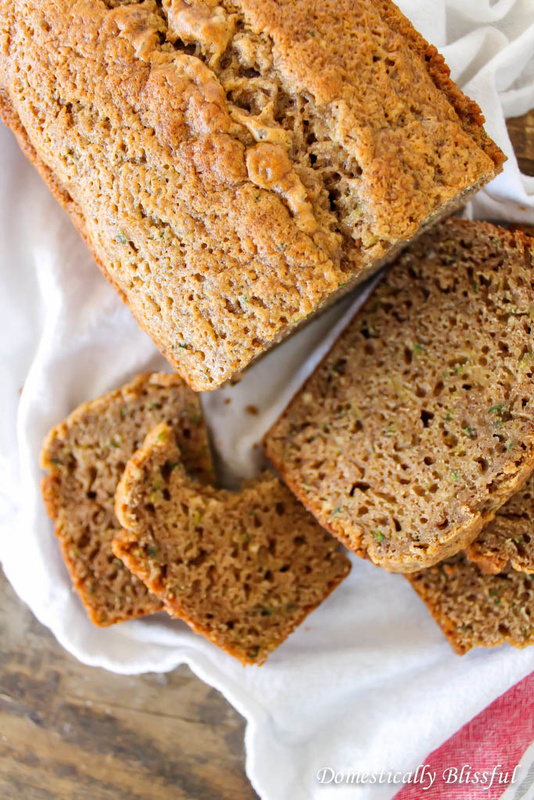 Bake your zucchini bread for 1 hour or until a toothpick comes out clean. Let cool on a cooling rack & enjoy (*2). *1. I prefer my zucchini bread without walnuts so I usually do one loaf without for me & one with (1/2 cup) walnuts for my husband. *2. Keep stored in a sealed container at room temperature for up to a week. 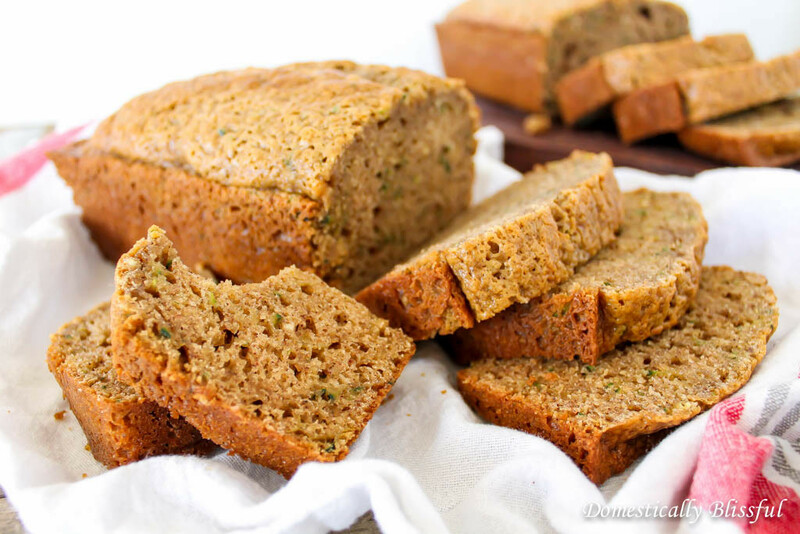 Did you enjoy your Homemade Zucchini Bread? & He will repay Him for his deed. I often use zucchini in baking but I rarely make it the star of the recipe. 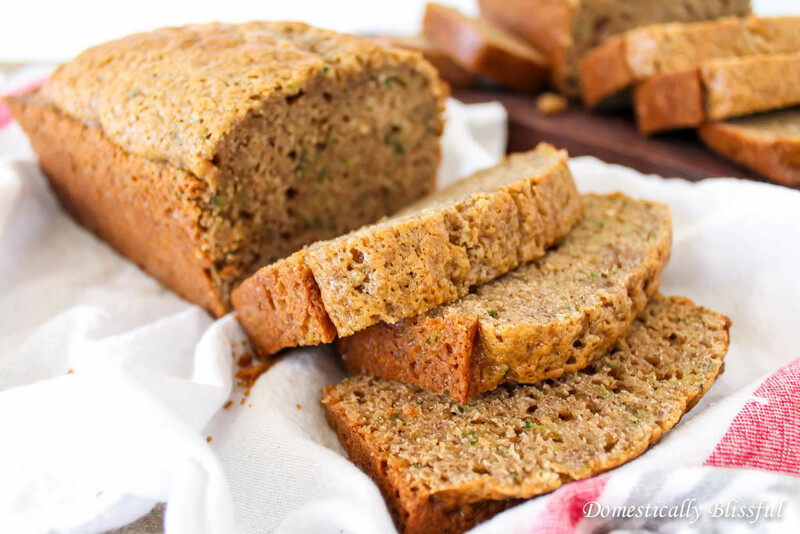 This zucchini bread looks super delicious and definitely something I need to try – I can imagine it would be perfect toasted for breakfast! When I first joined my husband’s family the idea of ZUCCHINI bread kind of freaked me out, I mean who puts vegetables in their bread? But after I tried it I fell in love. I hope you get a chance to make your own zucchini bread!